Expectations were through the roof for Nintendo’s 2018 flagship title, and after the impressive E3 Invitational tournament featuring some of Melee’s and Smash 4’s best players, as well as several truly hype-worthy Nintendo Directs promising the best Smash Bros. experience ever, including newcomers from Splatoon and Castlevania, Super Smash Bros. Ultimate had a lot to live up to. As Nintendo fans know well, hype can be a tricky thing - build up a game too much, and nothing can satisfy. Does Ultimate earn its name? Super Smash Bros. has been my favorite game franchise, full stop, ever since I was twelve years old and enjoying the heck out of the first entry on the N64. Sure, I didn’t know who Ness or Captain Falcon were, but Super Smash Bros. (1999) was both a fun party game and a unique vertical-and-platform-movement-heavy fighter with rules and mechanics unlike any other competitive title. Those unique mechanics, based on the ring-out principles of sumo wrestling, have evolved dramatically over the last 19 years. I’d argue that mechanics are the most important aspect of any fighting game (even if Nintendo’s dodgy about classifying Smash as such, Ultimate is clearly designed with serious play in mind), and in this respect, Ultimate doesn’t disappoint. The many changes to the game engine, such as the reworked Perfect Shield, increased speed, universal 3-frame jump-squat, and 0.85% damage multiplier on short-hop aerials, among other great refinements, wildly differentiate Ultimate from any other Smash title. Contrary to initial worries, Ultimate is far from a port of Super Smash Bros. for the 3DS and Wii U (which I’ll be calling Smash 4), which was slower, easier to pick up, allowed for less off-stage shenanigans, forced many more resets to neutral, and featured more imbalanced characters with less precise hit- and hurt-boxes. Ultimate isn’t quite Melee either, since you can now do nearly anything out of a dash, so micro-spacing options such as dash dancing and wave-dashing are less helpful. Instead, Ultimate takes most of the best elements of every previous Smash and combines them into a fluid, fast-paced, and no less accessible title, and what’s more, despite the ridiculous size of the roster and the game’s relatively short development cycle, we’ve never seen a larger pool of viable fighters, and they (as well as their many stages) have never looked so good. Ultimate’s triumph over the odds is a feat I might have deemed impossible had I not been playing it for the past month. Even with all of the fine-tuning, Ultimate’s main selling point to most fans lies in casual play, and in this regard, it excels wonderfully. The new Stage Morph mechanic, which allows you to pick two levels and have them rotate mid-match at timed intervals, adds spice and flavor to battles. More balanced items also drop at steadier rates than Smash 4 with better overall variety, and the many, many Pokemon and KO-able Assist Trophies make the casual experience the best it’s ever been. Squad Strike fights allow you to mix up your battles with multiple character picks - I really love the Tag Team mode that allows you to see your opponents’ picks but not the order you’ll fight them in. Also, the new Final Smash meter adds a lot to the chaos, especially in matches with many players. 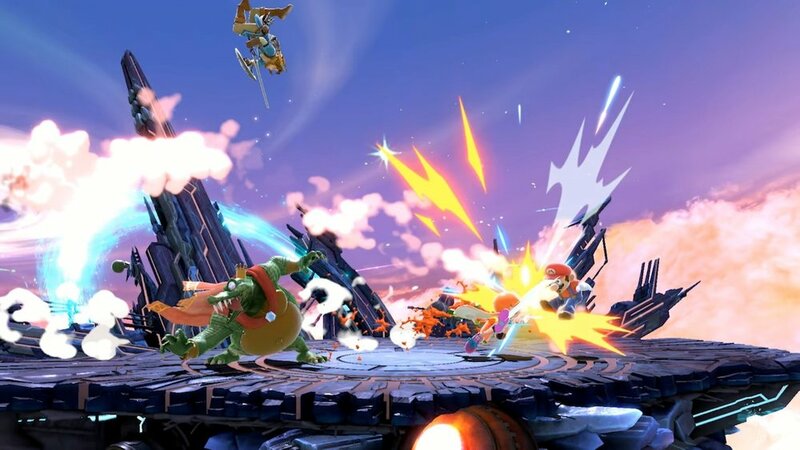 Final Smashes in general are quicker and less obtrusive, another welcome change. However, as always, Super Smash Bros.’ particular brand of magic is best experienced locally, with friends by your side (and not just because of the look on your buddy’s face when you snipe him with Falco’s down-air spike). The fact that Nintendo launched the Switch’s paid online services alongside Super Smash Bros. Ultimate inspired hope that the company might have gotten it right this time. This was unfortunately not the case. While the Battle Arena lobbies are a very welcome addition to the experience, for the most part, Ultimate’s Online is a mess. The lack of set competitive rulesets means that, even in Elite Smash, you’ll sometimes be stuck playing with someone else’s stacked rules or on broken stages. In an infuriating oversight, you also can’t switch characters between matches without disconnecting from your opponent. It’s also somehow impossible to play online with more than one person on a single Switch, which was a real deal-breaker for me. On top of that, Ultimate’s netcode is famously terrible - the peer-to-peer connections can be very glitchy and laggy in weird and unexpected ways, even with a LAN adapter. You are also penalized heavily for Self-Destructs; temporarily banning players who simply want to back out of an unfavorable match-up seems unnecessary, since they’re the ones taking the loss on their own time. While it’s true that Nintendo doesn’t charge much for their online service, the simple fact that Ultimate’s online is paid for, yet somehow worse than Smash 4’s, is rightfully inspiring a lot of frustration in the more serious communities. Perhaps fittingly, considering the thin Light-VS-Dark plot-line, I was of two polar minds regarding Super Smash Bros. Ultimate’s Adventure Mode, World of Light. On the one hand, it is a lengthy, often addictive mode that offers a lot of variety in its gameplay with many creative challenges. Also, the minor puzzles and secrets on the World Map are fun to discover. The Spirits themselves offer a great way to provide representation for certain characters and franchises that couldn’t make the cut, roster-wise. Some Spirits - not enough, I’d argue - do make for worthy, memorable battles, and the conclusion of the whole mode offers some pretty spectacular surprises. On the other hand, World of Light’s length is seriously padded out; it offers quantity over quality - I’d often attempt a supposedly difficult fight only to have the opponent’s AI glitch up and Self-Destruct, or find that cheesing certain battles out with busted Spirits was the only way to move forward. I suppose some would chalk this up to the unpredictability of the game or praise the half-baked Gatcha and RPG elements, but I honestly would have preferred fewer but more finely tuned challenges, such as the Event Matches that have been a series staple since Melee, especially since you can’t replay Spirit battles. Another big oversight: World of Light doesn’t feature a co-op mode, so you’ll be stuck facing the more ridiculous Spirits all by your lonesome. Your opinion on World of Light will probably determine whether you think Super Smash Bros. Ultimate’s single-player content is adequate, but honestly, I prefer Ultimate’s Classic mode, which features specific paths for each character, and surprise bosses for certain lucky ones. For instance, Ryu’s fights are one-on-ones based upon Street Fighter characters, Chrom is paired up with allies in a nod to Fire Emblem: Awakening’s pair-up mechanic, and all Legend of Zelda characters get to relive a memorable, legendary battle for their final boss. Classic is among the fastest ways to unlock characters, it’s fun and rewarding, and you’ll probably play each route multiple times to garner high scores. What’s not to love? Other single-player modes are suspiciously missing, and there’s enough of them gone (for seemingly no reason other than time constraints) that I’m holding out hope for a future update. Ultimate’s missing the Home-Run Contest, Stage Builder, Event Modes, Trophies, Smash Run, Smash Tour, Master and Crazy Orders, Break the Targets, Trophy Rush/Coin Launcher, and even a traditional All-Star mode. Mob Smash modes return, but only in three flavors - Century Smash (endless fighters), Cruel Smash (ridiculously overpowered opponents), and All-Star Smash (every fighter, in order of release, endlessly, 4 at a time). Maybe this is Nintendo’s way of getting players to invest more time in the Training Room, but there just isn’t much for a lone player to do outside of unlocking characters, grinding World of Light, clearing the Spirit Board, playing Classic, and buying things from the in-game Shop. In the final analysis, what makes a Smash game great? Is it its accessibility? Game balance? If your answer is either “fun mechanics” or “the variety and viability of the roster”, you’re probably really happy with Ultimate. Game Director Masahiro Sakurai mentioned in his Famitsu column how difficult it was to get all of the third-parties onboard this time around, so this may be the last time you’ll see Mario VS Pac-Man VS Mega Man VS Cloud VS Snake VS Sonic VS Bayonetta VS Ryu. With Persona 5’s Joker joining the fight and at least four more DLC characters to be announced, it’s looking like this really will be the definitive version of Super Smash Bros. The question then becomes, where can Nintendo go from here? Every single character that’s ever been playable in Smash is here, and while the competitive meta has barely begun to develop, a huge portion of the roster seems to be at least somewhat viable at high-level play, and miraculously, all of these refinements have been done without alienating casual players or losing the madcap charm that Smash has always possessed. There are close to 900 songs in-game. Each of the game’s 100+ stages features both a Battlefield and a Final Destination form. It’s hard to imagine how much more they can push the envelope. Ultimate’s single-player and online efforts may have some issues, but the core game itself is refined to a T. Mr. Sakurai and his team, aided by the input of professional Japanese Smash players, really outdid themselves with the most polished and satisfying mechanics and roster we’ve seen in a Smash title yet. If you’ve ever enjoyed a Super Smash Bros. game, you surely won’t go wrong with Ultimate. It’s one of the most ambitious fighting games of all time, and certainly among the top mascot crossover games in any genre. Ultimate is one for the ages, warts and all.